The Oase Pondovac 5 is designed to include many of the features expected with thier vacuums, but most have been upgraded. The biggest upgrade is the ability to pump the water away to waste, it overcomes one of the greatest drawbacks of other pond vacuums. This is that the waste water escapes under gravity and as such can not go up hill or very far away. Inside the water chamber is a silt pump which will pump the dirty water through a 33 foot discharge hose and up to 6 1/2 feet above the pond vacuum, although the higher you lift the slower the flow rate and suction will be. The silt pump will only handle small particles and so inside the water chamber is a prefilter bag which will catch large particles such as pebbles or leaves, and if your pond is full of large waste you may need to net these out first. Oase has created the c-connecton locking system that securely connects the discharge hose to the vacuum. The Pondovac 5 has new wheels and tires specifically designed for rough terrain, low-noise whilst in operation and a great clearance. It has the same robust aluminum suction tubes and the 5 varied suction nozzles provided with the Pondovac 4. It is supplied with a 2 year guarantee which can be extended to 3 years by sending the warranty card to Oase. 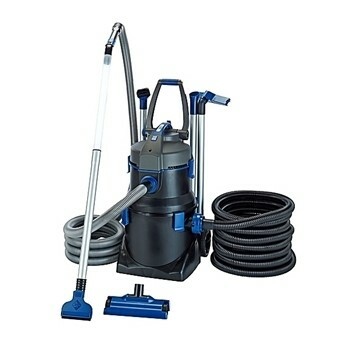 It has three optional accessories - a 33 foot extension drain hose with the C-connection, a telescopic pole which extends from 6 feet to 16 feet (replaces the suction pipes), and a 33 foot floating hose which must be used in conjunction with the telescopic pole. - 25' Dimensions (L x W x H) - 17.1" x 16.7" x 28.2"